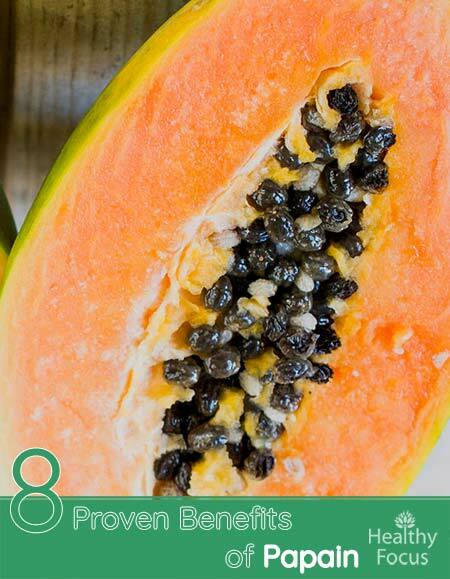 Have you considered what papain, an enzyme extracted from papaya, can do for you? Scientific studies have found that papain, much like the bromelain found in pineapple, can aid the body in digestion as well as provide a plethora of other health benefits. Due to its ability to break down difficult proteins in food, particularly meat, and its ability to dissolve toxins, this powerful enzyme has many uses. Papain is an enzyme wich is extracted from the raw fruit and the leaf of the papaya fruit and plant. Proteolytic enzymes like papain help break down amino acids into smaller proteins. This is the reason that papain is often used in the kitchen to make meat more tender. If you want to incorporate papain into your diet, you can do so by consuming raw papaya fruit. However, you can also buy it in supplementary capsule or chewable forms as well as in topical form. Papain is available in supplements on its own or combined with bromelain and other similar enzymes. Papain has been used as a traditional remedy for various conditions including digestive complaints, pain, wound treatment and to reduce inflammation. It is currently under the microscope and being studied for its potential to treat a range of conditions including cancer. Papain is an effective digestive enzyme because it reduces larger pieces of protein into much smaller pieces of protein. This papaya enzyme is also effective in breaking down peptides into the most miniscule amino acids by dismantling the bonds in the protein chain. Who May Benefit From Papain? Almost anyone can find a use for papain. However, those with an enzyme deficiency or who suffer from a low hydrochloric acid discharge in the stomach may find that taking the papaya enzyme helpful in digesting food, especially protein rich food like meat. As people age, they tend to have a decreased output of hydrochloric acid, making digestion more difficult. Taking papain may help make digestion a little bit easier for people as they age. Papain is not just a helpful digestive aid; it also has other far-reaching benefits as well. So what is papain enzyme good for? As mentioned above, papain’s main benefit is acting like a natural digestive enzyme and breaking down food, particularly protein. Research at the University of Michigan has shown that the papaya enzyme enhances the digestion process. This enzyme actively boosts the digestion process in the intestines and in the pancreas. Caricol which was used in the study is available online. You should add a packet to a glass of juice or water and drink it before your 3 daily meals. Studies have found that taking a papain supplement may help to reduce inflammation or swelling within the prostate gland. Although more thorough scientific research needs to be conducted, one study at the University of Maryland Medical Center found that when papain is taken in conjunction with other supplemental anti-inflammatories, the body produces natural anti-inflammatory agents to help quell inflammatory conditions such as prostatitis. According to the University of Maryland Medical Center papain is an effective natural treatment for wounds after surgical procedures as well as burns, bedsores, and skin ulcers. It is suggested that the best way to use a papain infused lotion is to apply it to wounds already in the healing process and should not be applied to open wounds. Research has shown that papain is also a great natural way to treat skin irritations and burns. Despite the positive results from the studies done so far, the FDA ordered companies not to market topical papain-based products because of some reports of people experiencing allergic reactions described as life-threatening. Before applying topical papain, you should consult your doctor to rule out the possibility of an allergic reaction. Nevertheless, topical papain creams and salves are available at certain health stores and online. Only use them under expert medical supervision, You should also do a patch test on a discrete area of skin before proceeding with a larger dose. To perform a proper patch test, apply a very small amount of your topical product to your elbow or the inside of your wrist. Cover it with a bandage and leave it in place for 12 hours. If you experience irritation, wash it off immediately and stop using the product. There is evidence that papain supplements can help ease muscle aches and pain. One study published in 2004 looked at the effects of papain on muscle pain in male athletes following a period of intense exercise. In the study, the volunteers were wither given a supplement containing papain and other protease enzymes. There is also evidence that proteolytic enzymes like papain could help with many of the symptoms of shingles including pain, neuralgia and skin lesions. One study found that papain is a good way to boost the immune system while going through cancer treatment. Research at Memorial Sloan-Kettering determined that enzymes like papain alter leukocytes in the immune system. Papain is rich in antioxidants, which can help protect the body from disease even some forms of cancer. Antioxidants scavenge free radicals and help to reverse cellular damage done by these roaming toxins. Taking papain orally along with other treatments may help to reduce painful swelling in a sore throat. According to research, it can help relieve many symptoms of sore throat including pain, swelling and redness. Unfortunately, this is the only research we have and more recent studies are lacking. Nevertheless, it may be worth chewing on a papain lozenge when you first develop a sore throat. Before taking papain, some factors should be taken into consideration. Consult a physician before taking papain. What are the side effects of papaya enzymes? Taking papain in large doses may be unsafe. Taking the papaya enzyme in large doses may result in severe throat damage. Applying papain directly to irritated skin may lead to blisters and further irritation. Some people may experience an allergic reaction taking papain. Consult your physician to determine if taking papain is safe for you. Those allergic to kiwi fruit may also be allergic to papain. There is currently not enough evidence to suggest if taking papain while pregnant or breastfeeding is safe. It’s best to err on the side of caution and avoid taking this enzyme while pregnant or nursing. Those with bleeding disorders should stay away from papain as it may increase clotting disorders. Stop taking papain two weeks prior to surgery as it may increase the potential for bleeding during surgery.